WinWholesale Opens New Regional Distribution Center in Colorado. WinWholesale Opens New Regional Distribution Center in Colorado. 256,000 square foot facility serves Western states. WinWholesale Inc. has opened a new 256,000 square foot regional distribution center in Denver to serve operating locations mainly in the western United States. The opening is five months after another newly constructed 200,000 square foot regional distribution center began operation in Middletown, Conn.
WinWholesale is one of the nation’s largest suppliers of residential and commercial construction and industrial supplies and materials. Both new facilities replaced smaller distribution centers in Denver and North Haven, Conn. WinWholesale also has regional distribution centers in Dayton, Ohio, and in Prince George, Va. Each is 200,000 square feet. The new distribution center has more than 2,500 square feet of training and multi-purpose space for presentations and working product displays accommodated by quick disconnects and floor drains for toilets, shower heads, faucets and other products. 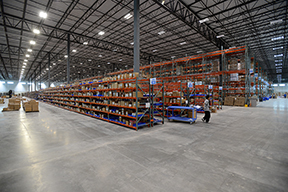 When WinWholesale announced construction of the two distribution centers in October 2012, CEO and Chairman Rick Schwartz said the facilities would fit in with the company’s growth strategy to allow the organization to expand. WinWholesale has more than 550 wholesaling locations in 45 states under the Win branded companies, Noland Company, Carr Supply and Wyatt Irrigation. WinWholesale Inc. (www.winwholesale.com), headquartered in Dayton, Ohio, is a leading supplier of residential and commercial construction and industrial supplies and materials to a diversified customer base. The privately-held company has more than 550 wholesaling locations in 45 states and offers entrepreneurs the unique opportunity to own part of the local business. Collectively, WinWholesale is known as “The Win Group of Companies.” In the group are companies conducting business-to-business wholesale distribution of plumbing and heating supplies; hydronics; industrial pipe, valves and fittings; heating, ventilation, air conditioning and refrigeration equipment; electrical equipment; industrial and commercial fastening hardware; waterworks and utility supplies; domestic, commercial and industrial pumps, and irrigation and landscape supplies. Follow WinWholesale on Facebook, Twitter and YouTube.